Clostridium difficile vaccines composed of surface polysaccharides (PSs) have the potential to simultaneously control infection and colonization levels in humans. Hot water–phenol treatment of C. difficile biomass can extricate water-soluble PS-I and PS-II; and water- and phenol-soluble PS-III. C. difficile vaccines based on PS-II have attracted the most attention due its facile purification and ubiquitous expression by C. difficile ribotypes. Anti PS-II antibodies recognize both C. difficile vegetative cell and sporulating preparations and confer protection against C. difficile infection in a mouse model. 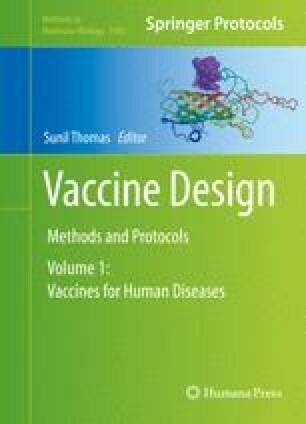 The design of such an efficacious C. difficile PS-II conjugate vaccine is described here. This work was supported in part by a Discovery grant from the Natural Sciences and Engineering Research Council (Canada) to M.A.M. The KLH conjugation immunogenic analysis and mouse model studies were funded and carried out by Stellar Biotechnologies, Inc. (Herbert Chow, Martin Sagermann).